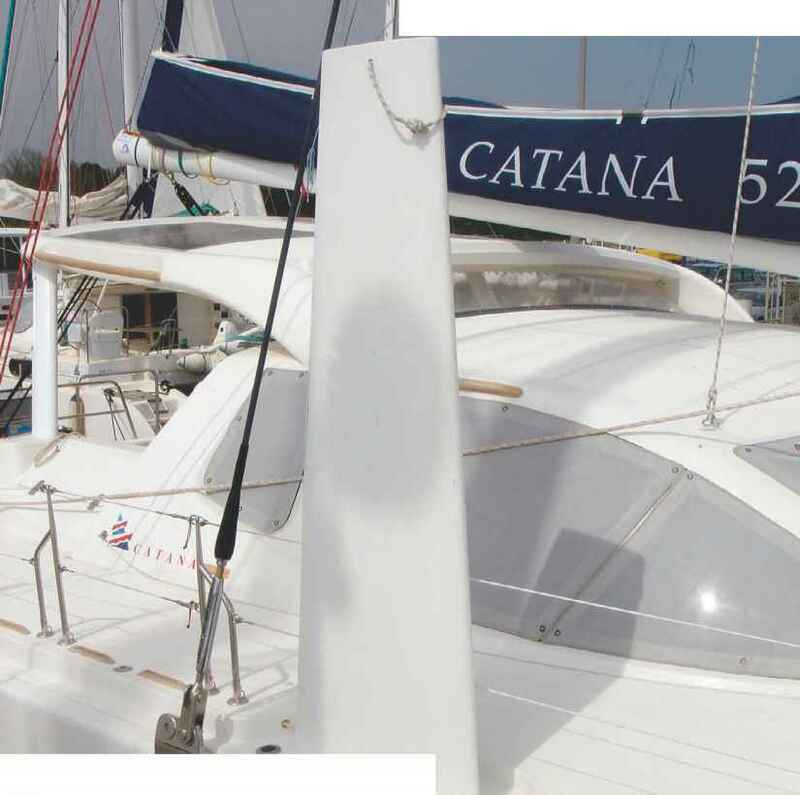 charter industry has a pronounced influence on the requirements and design of their fleet, setting standards for cats intended for private ownership. Design parameters for these vessels are often centered around 2-week multiple family vacations in the steady Trade Winds and daysails between closely spaced islands of the Caribbean. Obviously, the features of these keel catamarans put less demand on pure sailing performance or extreme upwind sailing characteristics; instead they please by offering solid construction, liveaboard comfort and simple and reliable handling. Man has learned much from nature. The centerboard provides excellent impact resistance as it can swing up into its case. However it is not as efficient as a deep daggerboard, which is better braced by its full-height trunk. designed production centerboard catamaran, there are few other mass produced centerboarders around. It should be noted that one great advantage centerboards have vs. any other underbody configuration is they theoretically retract when colliding with an object. In spite of this, most offshore or performance-oriented sailors clearly favor daggerboards or low-aspect-ratio keels. Daggerboard catamarans have several advantages over their keel counterparts, some are well known and others are more subtle and sometimes only recognized by people who have used them. Active safety aspects are advantages created by speed and the retractability of underwater appendages. I am a firm believer of faster rather than slower on oceangoing cruising catamarans. Many people might say that sailing fast is only for racers. But, let's think about this for a moment. The ability to reduce exposure time through speed is invaluable for cruisers. If, say, on a transatlantic passage you can shave off 5 days, then you have already increased your safety factor, in some cases by 25%. Not being a "sitting duck" is a nice thing, indeed. By having the choice, bad weather can be avoided, possibly eluding a spiral of negative incidences. In general, especially on long passages, a daggerboard cat will have a slight edge on speed over her keel counterpart. Although it must be said that the speed difference between a daggerboard and mini keel catamaran can often be minor and compensated for by good seamanship, a clean bottom and a light boat. Generally speaking, however, daggerboard catamarans will always be slightly faster than their keel equivalents, though the speed advantage of most daggerboard catamarans vs. keel catamarans is often exaggerated. On a typical day-sail a well-trimmed and tuned keel cat will hardly be slower than a daggerboard cat. Cats lack the feeling of being in the "groove," that monohull sailors enjoy. Effortless high average speeds, acceleration and sustained high-velocity surfing are phenomena fast multihulls offer as compensation. It should be noted that anything (even a barn door) can surf in the right conditions. Even keel catamarans can get onto a plane at speeds of up to 30 knots down large seas. I know a veteran skipper who clocked his Bahia 46 at 28 knots on one of his North Atlantic deliveries and we often sail at over 20 knots in open ocean swells. above Twin low-aspect-ratio keels are the only device supporting the entire weight of this 40' catamaran; it is perfectly balanced, simple and strong. The keels are completely foam filled and entirely sacrificial in case of a grounding; in case of a violent impact they would not compromise the watertight integrity of the boat. Depending on sea state, daggerboard catamarans will out-point their keel relatives by several degrees. They will also experience 2-5 degrees less leeway, which one would think isn't much; however, in an uncomfortable 100-mile beat it adds up to being more than 17 miles closer to your destination. 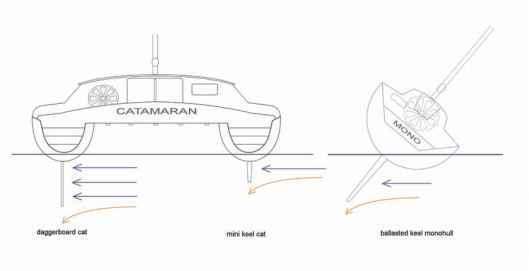 Let's take a 45' catamaran: the lift (to windward) generated by a daggerboard is almost twice that of a low-aspect-ratio keel - and the drag, with the board retracted all the way, would be almost 20% less. The most recent generation of cats with large beams and stately bridgedeck houses benefit especially from high-lift foils, since the windage of their projected area can add up quickly. The same cats with keels usually suffer from excessive leeway and sideslip. Keel catamarans however, especially in a calm sea state, reduce this disadvantage as boat speed and flow over their keels increases. When running downwind in extremely strong conditions the fixed keels could act as brakes that one cannot disengage. Since they cannot be retracted, their volume and resistance slow the boats' progress and, in combination with the forward pressure of the sails, force the bows down. This is notably the case with catamarans that have excessively long bridge decks, heavy extremities and low-volume bows. The greater the friction in the water, the bigger the pressure on the mast, and the more the boat is burdened. On the other hand, the volume in the keels increases overall buoyancy and in some aluminum cats this cavity can be used as fuel or water tanks, effectively increasing stability. On a daggerboard multihull a neat trick is lifting the daggerboards and tacking downwind. One can actually increase apparent wind by pointing up, inducing leeway and sailing faster to one's downwind destination. Cruising catamarans are often presumed to tack slowly and react sluggishly to the movements of the helm. This is certainly true for some heavy keel catamarans but much less so for ones equipped with boards. In convoluted seas, some of the heavier keel cats' only option for a safe tack is back-winding the jib or gybing. Monohulls with only one fin will always tack quicker than multihulls, just as foil-equipped catamarans will be more responsive than keel multihulls. Modern hydraulic steering systems are easy to build. Most helm stations are located behind the main coachroof, often the only alternative for the builder. Mechanical steering will give the ultimate feedback and fun at the helm. However, most of the time the dependable autopilot does its work and could not care less about rudder feedback. Another advantage of daggerboards is to afford better steerage under one engine. If you lose one engine and retract the board on the hull that has no power, but leave the powered hull's foil down, the boat will turn easier. Because of the retracted foil on the non-powered side, there will be much less drag-induced turning moment, the boat will be more balanced and the other side's lowered board will provide sufficient bite for "survival" steerage. Especially in high crosswind situations, a catamaran with both boards down can be easier to control than one with shallower keels. Usually harbor maneuvers under power are low-speed operations, and this is where twin boards excel yet again, and facilitate handling and precision docking. Daggerboard cats can also motor a bit faster, since by retracting the foils they have less resistance. When surfing down long waves in strong conditions, resistance to pitchpoling is imperative. Full-buoyancy bow and stern hull sections, centered weights and a conservative sailplan will allow safe surfing speeds. In some situations, raising the daggerboards will be of great advantage as it induces leeway, at the same time reducing resistance. In wind-against-tide situations, deliberate leeway will balance the boat against the opposite wind pressure. In light air, the catamaran will sail faster on a close reach than on a beam reach. Leeway towards the destination will turn the apparent course into a true course. In stronger winds, the same theory applies if the wind is aft of the beam. one-stop Southern Ocean circumnavigation at age 63. The French press compares Bruno to sailing legend Vito Dumas and has published his accounts in an article titled: "The Impossible Route." He explained that in the Southern Ocean, in the most convoluted conditions he would simply raise both boards, lock the helm to windward, and lie a-hull with no sails. "Brumas Patagonia" would safely slide down the steep faces of waves and drift minimally to leeward at about 1 nautical mile an hour, while he was either resting or reading. The turbulent water spoil of his sidewards drift would help keep the edge off cresting waves and often prevent them from breaking. While it was blowing 70 knots and higher, he felt very safe, and in fact, the world around him appeared to be "peaceful and quiet" as he mentioned. It is not only in the Southern Ocean that one encounters steep, breaking waves. Major capes and the Gulf Stream are notorious for rough conditions where the ability to navigate safely becomes imperative. In those environments any proven and strongly built daggerboard cat would have a slight advantage if her boards were lifted, although a well-designed keel catamaran could get through unscathed. In extreme weather, and I am talking beyond Force 10, it is very important to enable a catamaran to sideslip rather than allowing the possibility of a trip, and maybe a flip. A catamaran's behavior in towering side waves creates vulnerability and the possibility to lift underwater appendages is essential, especially if one has lost the ability to steer. The disadvantage of a keel catamaran in huge beam seas is more psychological than real, as these types of vessels, typically, also slip sideways. In survival conditions or emergencies, the use of parachute anchors, which force the boat into a certain attitude, are often thought to be the only solution for most boats. In my mind, this tactic should be used only if one has lost steering. Using a sea anchor places enormous strains onto the structure of the vessel and renders one helpless when the odd rogue wave smacks into the boat from a different direction. It is better to actively manage survival conditions by controlling and slowing the vessel with the use of drogues. We have learned a great deal from the aerospace industry and the result is a technological trickle-down effect to monohull keels. Multihull designers and builders greatly profit from the advanced research that has been done in the field of NACA sections (National Advisory Committee for Aeronautics) and foil performance. Keels and daggerboards come in a variety of aspect ratios; most are based on low-speed foils, where drag/lift characteristics have been optimized. To increase lift even further some performance catamarans also utilize asymmetrical daggerboards, shaped flat on the outside (leeward) and cambered on the (windward) inside. As they can only be used one at a time, asymmetrical boards are somewhat limited in their adaptation for cruisers. Since multihulls do not heel, their underwater appendages are more effective in retaining positive flow than their monohull relatives. This is the reason autopilots burn out less often and can be used in heavier conditions on catamarans. 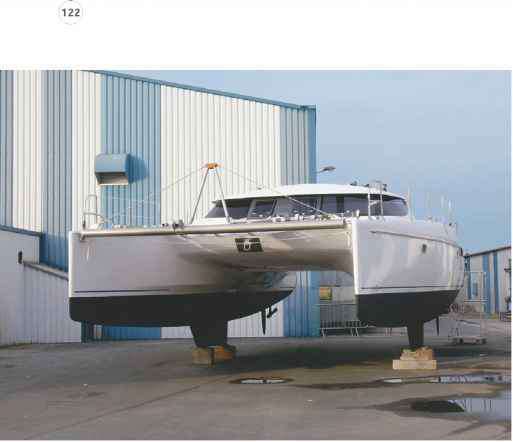 As the monohull heels, not only is the upper part of the keel blanketed by the underbody of the vessel, but flow is also lost as the water slips past the angled keel to leeward. This was especially prevalent on the early IOR monos, which had extremely beamy, shallow bilges and high prismatic-coefficient center sections. 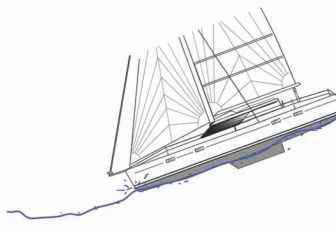 To compensate for this loss of heel-induced flow, monohulls need deep-draft keels to make good progress to windward. 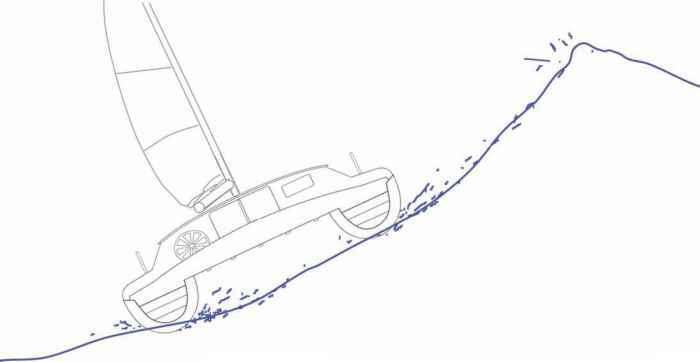 The keel or daggerboard catamaran, on the other hand, can create lift more efficiently for the same keel surface area, not only because it has two keels vs. one, but also its minimal heel keeps its underwater appendages perpendicular in the water. below A typical daggerboard will spend the majority of its time in the "up" position. 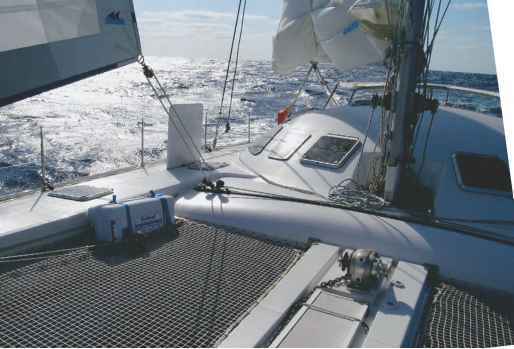 It is lowered when beating upwind in order to reduce leeway or aid in the directional balance of the catamaran. Well-designed cruising catamarans have the ability to slide down steep waves. Even multihulls equipped with mini-keels can safely resist tripping caused by too deep underwater appendages and/or low buoyancy hulls. 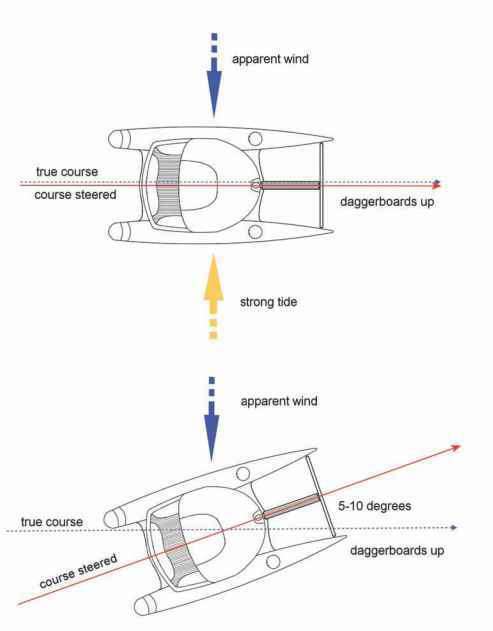 far right Long, high-aspect-ratio daggerboards have the advantage of being very efficient foils, yet in the up position can present considerable windage in a storm. Usually daggerboard catamarans have a higher aspect ratio and are deeper than equivalent length monohulls since daggerboards are retractable and have no draft considerations. It is not surprising to see that in wind speeds starting at around 10 knots, a well-designed and sailed daggerboard cat will often outpoint and outpace a performance monohull. Even well-sailed keel catamarans often arrive earlier at an upwind destination compared to heavy monohulls. The few degrees they sacrifice of their ability to point to windward is often made up for by their higher speed and VMG (Velocity Made Good). This performance difference increases proportionally to the wind speed and is very noticeable in F4 conditions and beyond. A well-known fact and possibly the single biggest disadvantage of daggerboard cats is the vulnerability of the boards and trunk in collisions. This is most detrimental in the case of poorly built and designed trunks, which cause flooding on impact. Obviously, this is not the case with keels, which would deflect a minor obstacle or, in case of hitting a container or whale, simply break off. The best protection against collision damage are sacrificial mini keels, which would simply sheer off, leaving the hull completely intact. Clearly, the most critical area in daggerboard design is the construction of the daggerboard trunk. It is usually heavily reinforced with massive gussets, especially at its aft bottom end, and extends from the bilge to the overhead. Typical forces on the trunk easily exceed the pressure of the wind on the sails. Dynamic forces of wave action and the shock loads of slamming into seas or solid objects require this area to be one of the strongest and best engineered of the entire vessel. Unfortunately, a lot of low production daggerboard catamarans suffer greatly in this crucial zone. Usually the foils are located just aft of the main mast-bearing crossbeam and are somehow tied into this unit to profit from its stiffness. The more "left over" daggerboard remains in the scabbard in the fully down position, the better it is braced, so it is not surprising to see foils that are 18' long for a 60' boat. It is easy to see why a daggerboard catamaran is able to provide maximum lift via its twin vertical foils. Multihulls, which are equipped with shallow mini-keels will be slightly less efficient. The heeling mono will suffer the greatest loss of pressure. Builders who take their job seriously go to great lengths to make this crucial area as strong as possible. In a recent conversation with the manager of a reputable French production yard, he stressed that the daggerboard trunk is engineered and constructed seven times stronger than the composite board which it houses! In case of a violent impact, the foil, which has weak spots designed into it, will snap and leave the daggerboard trunk unscathed. It is a type of impact philosophy, or a safety fuse, just as it is employed on sacrificial fixed keels. Similarly, minikeels are a completely separate part of the hulls and will not allow water to enter them in case they break. The careful engineering and experience necessary in building reliable daggerboard or keel cats stresses the importance of a production yard which has built them consistently. This aspect should not be taken lightly if one ventures out into the open sea, even if it is only 20 miles offshore. Builders of keel cats often add daggerboards to their designs, with the objective to market increased performance and safety. This usually results in a compromise when considering the hydrodynamic hull requirements of both types, which might differ substantially; proper integration, engineering, and construction become crucial factors. - that dictates the proper positioning of the daggerboards. Nothing is perfect, and this analysis would be worthless without mentioning the pros and cons of both the underwater appendages. Daggerboards, their surrounding structures and systems are more expensive to build, so builders prefer to stay away from them, if given the choice. On some catamarans, especially smaller ones, or those that have the trunk in the center of the hull, the interior passage in the hulls can be crammed. Again, it should be mentioned that an incorrectly designed and constructed daggerboard multihull can be more of a detriment than an advantage. In some cases it can be extremely dangerous. 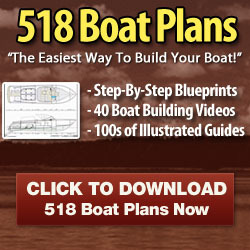 If the trunks are not massively reinforced, and if a violent collision occurs, one hull could flood and cause a capsize. One would be much better off with a well-designed and constructed keel multihull than a mediocre or untested one with daggerboards. Yet, daggerboards give you choices that keels don't. It is similar to the new generation of cars with Tiptronic gearboxes, which offer you an automatic transmission with a clutch-less manual override. By physically selecting the proper gear, torque can be adjusted to suit the conditions. The daggerboard-equipped multihull shares the same advantage. The boat can be fine-tuned to optimize the level of efficiency of the vessel's motion through the water. By adjusting the boards, one can achieve superior sailing characteristics, resulting in higher speeds and generally more fun on the water. Active safety aspects of reduced exposure time, better maneuverability and shallow draft provide significant benefits. However, for safety reasons, today most catamaran builders opt for fixed keels and completely separate the keels from the hulls. 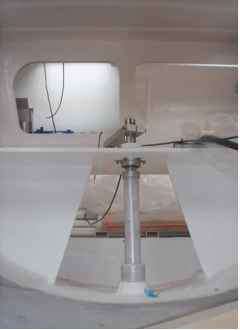 This is a feature that preserves and protects the watertightness of the boat in the event of violent impact. 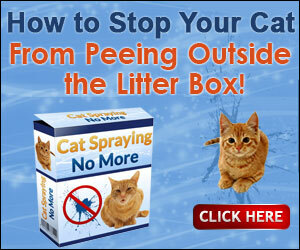 Furthermore, if such a situation arises, it makes them easier to repair or replace. Fixed keels require no manipulation such as daggerboards do and always provide perfect protection for drive shafts, propellers, rudder blades and hull bottoms. Remember, daggerboards have to be in the down position to protect other appendages, while keels are always down. Lastly, the absence of a centerboard trunk means space savings in the interior of the vessel, which usually results in larger living area. above Water tanks are conveniently housed within the aluminum keels, thereby creating a secondary watertight structure. The weight down low also contributes to a slight increase in transverse stability. below Very low-aspect-ratio keels have the advantage of less than 4-foot draft as found on this 70 foot catamaran. Note how this cat is being transported. The entire weight of the boat is placed on the truck's trailer and supported by its very stiff bridgedeck alone. above Well braced on top and at the bearing end, this aluminum rudder post will provide years of service and even resist minor impacts with floating objects. right A smart daggerboard lifting rudder mechanism as found on the Gunboat 49. Today we continue to strive to find the perfect compromise in our vessels to satisfy our most important requirements. We should be deeply thankful for the thousands of keel multihulls that have revolutionized the charter industry and many good boats have evolved from this trend. Reputable daggerboard catamarans and well-designed keel multihulls will continue to be the choice of future generations of serious offshore voyagers. Both have their advantages and disadvantages and it is important to understand both in order to make the proper choice. 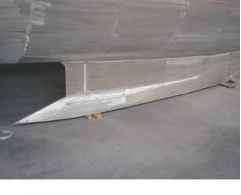 How to protect daggerboard trunk from groundings? 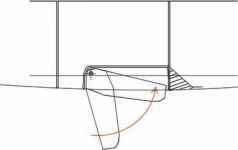 How to find perfect proportions for catamaran turning efficiency?